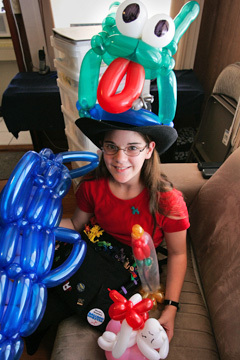 Caris Hamm, 12, wearing a "jumping frog hat"has won several awards for her balloon skills. Take a deep breath, as we're about to enter a world unknown. Unless you're a clown or a kid, that is. 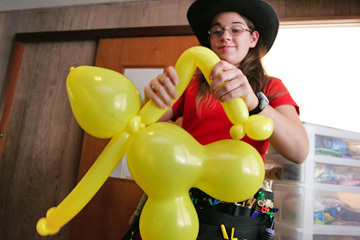 The subject at hand is balloon twisting -- the craft of inflating balloons and twisting them into a variety of shapes and animals. Ladies with hat pins and guys with cigars should stop reading right now -- you aren't welcome. Talk about pop culture! It turns out a whole subculture is devoted to this arcane craft, with international contests and grandmasters of twisting, awe-struck disciples and a busy Internet community buzzing with twisty talk and rubber reviews. For fear of bursting your bubble of complacency, who knew? Who knew, indeed? We're led into this by a child, Charis Hamm of Kaimuki, 12 years old but possessing the gravitas of a rather solemn adult, who has become a darling of the balloon-twisting community here and abroad, who recently won a first-place award at a national convention and who can often be found twisting the after-school hours away with local mentor Chris Da Clown. » The first balloon animals were made by the ancient Aztecs out of the scraped and cleaned bowels of cats, which were then presented to the gods as a sacrifice. When the supply of cats ran low, human entrails could be substituted. Ironically, cat entrails were used to make balloon dogs. » In 1824 the first balloons made of rubber were created by professor Michael Faraday of London's Royal Institution to use in hydrogen experiments. » The following year, the first toy balloons were produced, sort of. They came as a DIY kit that included a bottle of thin rubber solution for painting over a glass form. » Vulcanized balloons, unaffected by temperature, were created by J.G. Ingram of London in 1847. » Balloons became a staple of vaudeville performers. Sally Rand, a well-known ecdysiast, used to pose coyly behind large, specially made balloons. They began popping mysteriously, exposing Rand au natural, until it was discovered that a fan was shooting paper clips at the balloons with a rubber band. Even this background can't quite prepare you to meet Charis, who wears a businesslike apron with hundred of balloons sticking out, surmounted by a portable air pump in a fanny pack. "They're mostly adults. The children there are the children of twisters, mostly. It was the most exciting week of my life!" said Charis, whose name is pronounced CARE-iss. "I was very pleased that my hero, Ralph Dewey, presented the award to me." Dewey leads the "Christian Twister" school. "When I was 7 years old, I went to the Collingwood Farmer's Market in Edmonton and saw a man twisting balloons," said Charis, whose family is on temporary assignment in the islands. "On the way home, I bought a balloon-animals kit at our favorite bookstore. Over the weekend, I used up all the balloons and made most of the figures in the book." The next weekend, she went to a children's festival in town and methodically started quizzing adults about balloon supplies. She was directed to Dubetz, whose Balloon Gang store turned out to be a only a few blocks from her house. Even at 7, Charis knew she needed better-quality latex. The balloons used by pro twisters are much better quality than the supermarket packs the rest of us are used to. "I use Qualatex balloons. They biodegrade as fast as an oak leaf. If you keep your sculpture in the refrigerator or freezer, it will last a long time. Otherwise, in two weeks it will be half-sized and lose its shine." She whipped up some creations quicker than it takes to type this -- "Ralph Dewey's Jumping Frog Hat," "Rose Under Glass," "Sleeping Kitty," "Chris Da Clown's Dolphin." Balloons are labeled by inflated size, in inches: 2 by 60, 1 by 60, 3 by 50 and 6 by 26 are common sizes. Bending and rubbing the balloon causes it to curve in that direction. 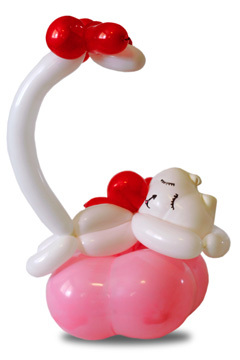 Each twist takes up about a half-inch of balloon length, so factor that in when inflating. Letting air out is called "burping." Always hold the first and last bubbles in place until the sculpture is done; otherwise it will dissemble. Friction is the thing that holds it all together. Scraps of balloon can be recycled. Galaxy markers are superior to Sharpies in marking balloons. And good-quality balloons have a labeled shelf life, like fruit. 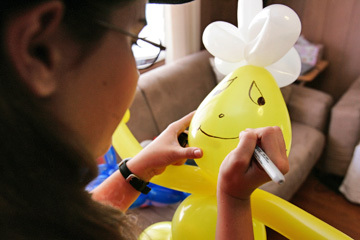 Eventually, one can become a "Certified Balloon Artist," a title bestowed by Pioneer Balloon, makers of Qualatex balloons. Yes, there are tests and standards. While in Hawaii, Charis and her brother are home-schooled. On the shelf with other learning materials are DVDs called "Ken Stillman's Awesome Balloon Series," a multivolume set that Charis vouches for. 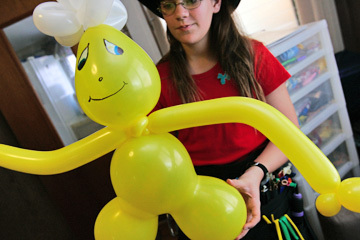 Has balloon twisting helped her social life? Or is it a career field? Charis looked thoughtful. "I don't know how long I'll do it. It is fun at the moment. I can tell you that the minute you start twisting balloons, you are quickly surrounded by a crowd. It has helped my self-confidence to perform in front of crowds." She then attempted to teach her audience of one how to twist a balloon into a poodle: "Don't be afraid. It won't hurt if it pops. Twist it, hold it, bend it over, twist again, that's it, sort of, twist a longer piece, oh!" -- diplomatically -- "I guess half a poodle is better than none." 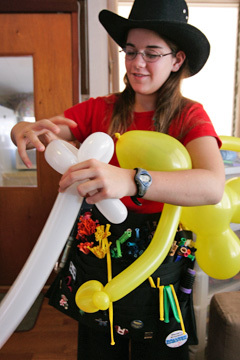 Caris Hamm gave a balloon-twisting demonstration in her home in Kaimuki.